I made these deliciously chocolatey cookies for our new first years to welcome them to the history department. The recipe is adapted slightly from Dan Lepard Short and Sweet: the best of home baking (233). I will be making it again. 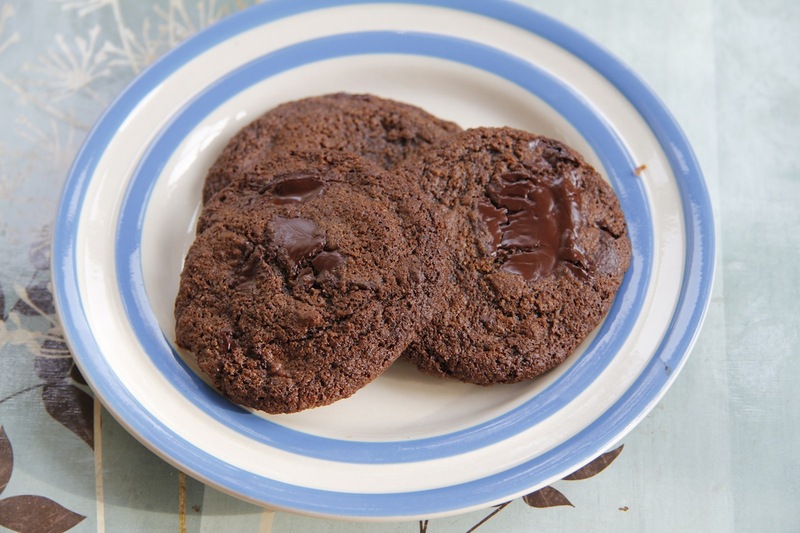 Double Chocolate Chip Cookies: 125g butter, 200g dark brown sugar, 2 tsp vanilla, 1 egg, 175g plain flour (I used wholemeal), 25g cocoa, 1tsp bicarbonate of soda, 300g of Montezuma large 70% dark chocolate buttons – do not compromise on the quality of the chocolate that you use – this is my motto for life! Heat oven to 170C. Beat the butter, sugar and vanilla extract together until light and fluffy. Add in the egg. Sift the flour, cocoa and bicarbonate together and then fold in. Add in the massive chocolate chips. Place walnut-sized balls of the mixture on a baking tray lined with baking paper. Keep them some distance apart as they will spread. Bake for 12-14 minutes. Allow to cool on the tray for a bit and then move to a wire rack. These did not last long!